PHP is a server-side scripting language which is designed for web development. Before knowing the benefits of the php frameworks, make this clear that what does the php framework mean? PHP frameworks makes development of web applications written in PHP very easy and more efficient. In simple words, PHP frameworks helps to promote rapid application development, which saves your time, reduces the amount of repetitive coding for developers. The general idea behind the PHP framework working is Model, View and Controller (MVC) concept. MVC is an architectural pattern in programming that apart business logic from the UI, and allows one to be modified separately from the other. With MVC, Model refers to data, View refers to the presentation, and Controller refers to the business logic. MVC breaks up the application development process allowing you to work on individual elements while others are unaffected.This makes coding in PHP faster and less complicated. Below are the benefits of using php frameworks. As explained in previous paragraph, the separation of the business logic and UI leads to cleaner and maintainable code. 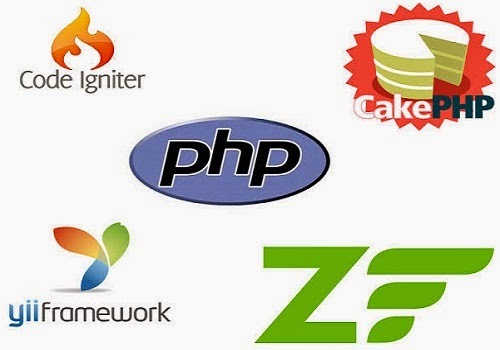 The famous php frameworks like Cakephp,Codeigniter,zend etc. supports almost all the databases like MySQL , SQL ,ODBC and Oracle. Every php framework has its own file structure and some standards.Following standards reduce lots of your work.Well organized file structure will keep the various parts of the application (admin,UI,core) in separate directory for easy managing. If you're working with simple corephp, just think about the queries: you have to manage numbers of tables, relations,joins ,foreign keys,conditions....any single mistake and your application gets ruined..!! PHP Frameworks will help you to get the rid of these things. you just have to follow standards and simple statements for the queries and rest of the things will be handled by the framework itself. Almost all the popular php frameworks have very active and large community support.Thousands of developers are engaged to provide the constant contribution for the framework and help you to sort it out your queries. Most of the popular php frameworks have security implementations which provides CSRF protection, SQL injection prevention, and XSS protection to make your application safe and secure. The biggest advantage is the role of community they have, if you find any vulnerability or a security hole or a bug, you can easily submit it to the framework developers and let them know so they can fix it. Most of the popular frameworks use a bit of mod_rewrite magic to ensure that your URLS are always clean and accessible.Such accessible URLS also helps in SEO by making your blog post links like /blog/view/benefits_of_frameworks/ which is going to boost your search engine ranking for those keywords more than /blog/view.php?id=10 ever could. All php frameworks works with the concept of either module , plugin or extension.In simple words plugin, extension or module adds extra functionalities to your application. If you have written any of these to accomplish your specific requirements , then they can also be used by others just by publishing them to the market. There are thousands of such plugins available in the market as a free product or paid which you can use for your application with no configuration or little changes in your application. Many of the php frameworks have their own specific debugging methodologies that makes the debugging very easy. All of the above benefits are those which comes to my mind while writing this post, if you know any other that I missed then you're most welcome to submit.just comment in the below form and i'll add into the post.